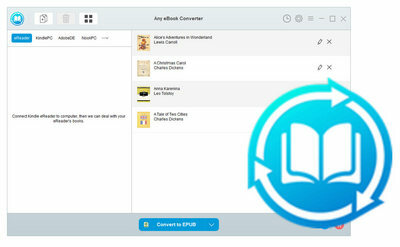 Any eBook Converter is a powerful eBook Converter to convert eBooks to EPUB, MOBI, PDF, AZW, TXT and KFX as well as a professional eBook DRM removal tool to remove DRM from Adobe, Kindle, Kobo and Nook eBooks. Support editing important metadata of the eBooks after conversion, including the title, author, and publisher, etc. Support batch conversion; Extremely easy to use with intuitive interface. 1. After purchasing the program, you will receive an email with registration e-mail and code shortly. Please check your inbox a while later. If you do not receive your code in a few hours, please check your spam filtering in case that the confiramtion email gets marked as spam and sorted into the "Spam" folder or deleted. 2. This payment via 2CHECKOUT does not include value added tax. You may need to pay VAT varying by country. 3. Please download the product through https://www.any-ebook-converter.com/download.html and enter your license to activate the program.